A federal judge gave Elon Musk and the Securities and Exchange Commission two weeks to resolve a dispute about whether Mr. Musk had violated a settlement he reached with the commission in October and should be held in contempt of court. 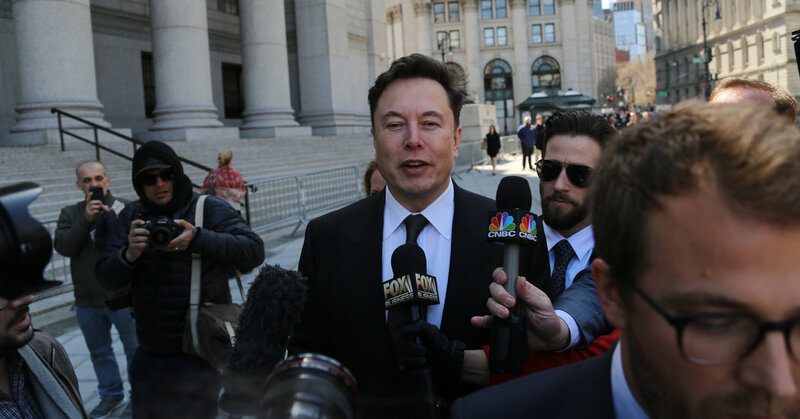 Judge Alison J. Nathan of Federal District Court in Manhattan told both sides to “take a deep breath” and put on “their reasonableness pants” after a roughly 90-minute hearing attended by Mr. Musk, the chief executive of the electric car company Tesla. In Round 2 of the battle between the S.E.C. and Mr. Musk, the question for the judge came down to whether the voluble entrepreneur’s Twitter post on Feb. 19 about Tesla’s production figures violated the terms of the October settlement. In the post, Mr. Musk said Tesla would produce about 500,000 cars in 2019. A month earlier, the company had said it would sell 360,000 to 400,000 cars this year. In a subsequent post, Mr. Musk said the company would in fact deliver about 400,000 cars in 2019. The S.E.C. contends the settlement required Mr. Musk to get approval from a Tesla lawyer before publishing any Twitter posts that include potentially market-sensitive information. Lawyers for Mr. Musk have countered that the message did not contain material information and that if Mr. Musk made an error he corrected it in the second post. A lawyer for the S.E.C. disagreed. But Judge Nathan said she, too, wondered if there was a “lack of clarity” and whether the settlement should be modified or struck down. Mr. Musk, who did not speak during the hearing but passed notes to his lawyer, nodded in approval at Judge Nathan’s remarks. After the hearing, surrounded by reporters, he said, “I feel very much loved,” before getting into the back seat of a Tesla Model S and being driven away. “I have great respect for Judge Nathan, and I’m pleased with her decision today,” Mr. Musk said in an emailed statement later in the day. The judge’s directive that the parties work out their differences is something of a victory for Mr. Musk, who could have been fined if he was found to be in contempt. The October settlement arose from a civil fraud complaint the S.E.C. filed against Mr. Musk and Tesla for a Twitter post in which he said he had “funding secured” to take the company private at $420 a share. It turned out that the plan to take the company private was not nearly as far along as Mr. Musk had suggested. Under the settlement, Tesla was required to establish procedures to oversee and preapprove Mr. Musk’s written communications, including Twitter posts, that might have material information about the company. The settlement forced Mr. Musk to step down as chairman of Tesla and pay a $20 million fine. The company paid the same fine. In his wrangling with the S.E.C., Mr. Musk has shown open disdain for the agency. Just days after reaching the settlement, he taunted regulators on Twitter, calling the commission the Short-seller Enrichment Commission. In an interview with the CBS News program “60 Minutes,” Mr. Musk said he did not respect the regulator.